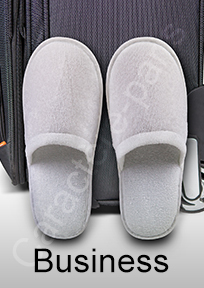 This single-user slipper from our popular BUSINESS line features a semi-rigid sole that prevents slips and falls in humid environments. The spongy tissue composed of micro ringed cotton and polyester fibre provides ideal water absorption to comfort your clients' feet, especially during an exit from a shower or bath. We placed a supplemental layer of moussy fibres under the heel to offer a premium level of comfort. Manufactured from a natural rubber (non-synthetic), the sole offers a unique softness and comfort while walking. 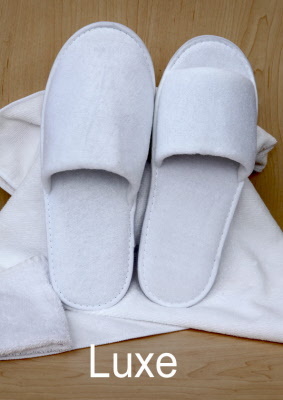 The Business slipper comes in white, with the option of open or closed-toe designs and three different sizes. Each pair of slippers is presented in an individually-wrapped, transparent plastic bag. Within Great Britain : 48 hours with Parcel Force.